The Better Business Bureau is known for helping consumers fight fraud and other dishonest business practices. Having BBB accreditation as a business lets customers know that business owners advertise and represent their products and services accurately. Zippy Shell Greater Columbus is proud to be a BBB Accredited Business that provides exceptional service and gives back the to community. When you use a business that has BBB accreditation, you can count on receiving quality products or services. If you do run into any problems, the BBB helps resolve these issues with the business in question. At Zippy Shell, being part of the BBB accreditation program means that we’re dedicated to providing the best customer service possible when it comes to moving and storage services. Instead of focusing on the bottom line only, we pride ourselves on going above and beyond what is expected and helping our customers find moving and storage solutions that are both convenient and affordable. What does it mean to be accredited by the BBB? To be a BBB Accredited Business, companies must undergo a thorough review by the BBB and meet strict standards of reliability and integrity. Companies also have to pledge to keep following these standards and agree to work with the organization to resolve any disputes or complaints that occur. While non-accredited businesses can receive good ratings from the BBB, those with accreditation also indicate that they are committed to having honest dealings with customers at all time, which provides consumers with peace of mind. 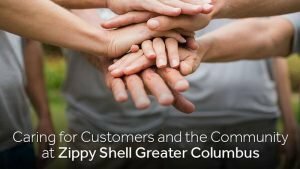 Zippy Shell of Greater Columbus has given back to the community in a number of ways. 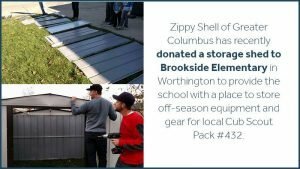 Recent examples include donating a storage shed to Brookside Elementary in Worthington to provide the school with a place to store off-season equipment and gear for local Cub Scout Pack #432. We’ve also participated in No Child Wet Behind events for charity. This organization, which focuses on making sure that families in need have steady supplies of diapers, holds 5K runs and other local events to raise funds. At Zippy Shell, we’re proud to support this foundation and its goals. We also participated in the Lifeline Christian Missions’ Hurricane Matthew Relief Pack for Haiti on October 12, which involved packing nutritious meals for those who were affected by this major storm. This event allowed us to help those in need while also connecting with other members of the community. If you need moving services or storage services, please contact Zippy Shell Greater Columbus. We’re currently offering length-of-stay promos for 15-foot containers, including a regular online discount for stays of one to five months, $40 off the base price for 6-month stays and $50 off the base price for 12-month stays.